The State Department’s Bureau of Medical Services estimates that 40% of Foreign Service personnel who work at posts where they are exposed to traumatic events (including assault, war, violence, or injury) experience intrusive symptoms of Post-Traumatic Stress Disorder (PTSD). An estimated 70-80% of those serving in high risk areas suffer from emotional responses tied to stress. In recent years, the U.S. government has prioritized services to better manage and prevent stress-related problems, including PTSD, for Foreign Service personnel and other Frontline Civilians. We’re proud to launch the new Frontline Civilian resource hub in partnership with the International Peace and Security Institute (IPSI) and the Association for Diplomatic Studies and Training (ADST). The Hub includes training, education, self-assessments, and activities on building resilience and preventing/recovering from PTSD. 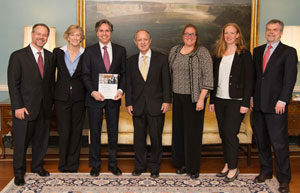 The Cox Foundation championed the creation of a “center for lessons learned” at the State Department, now called the Center for the Study of the Conduct of Diplomacy. To launch these efforts, the Cox Foundation commissioned two projects with the RAND Corporation to support the Center’s initial efforts. The first phase produced two case studies: “State Department Coordination of US Disaster Relief: Lessons Identified from the Provision of Humanitarian Assistance after the 2004 Asian Tsunami and the 2010 Pakistan Flood,” and “Sanctions Diplomacy: Foreign Service Tradecraft Lessons from the Implementation of Sanctions on Burma and Zimbabwe.” These case studies have been adapted for classroom use within the Foreign Service Institute, and serve as models for future case studies prepared by CSCD staff. The second RAND project examined “best practices in lessons learned,” and assessed how organizations use lessons learned initiatives to promote a culture of learning. The project included roundtables on best practices with military, other government organizations, and the private sector. 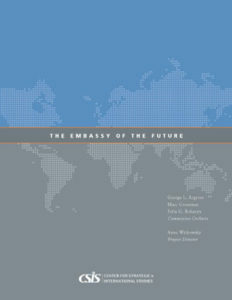 In 2007, the Cox Foundation and the Center for Strategic and International Studies, in partnership with the Department of State, produced The Embassy of the Future. The study examined challenges American diplomacy faced at the beginning of the 21st century, a period of historic change in international relations. The study provided recommendations to address the tension between diplomacy that meets security needs and also achieves effective outreach and advocacy. It argued for a new kind of diplomacy and a new kind of diplomat. The Foreign Service faces unique challenges in supporting employee professional development. Foreign Service entry, promotion and assignments are competitive; Foreign Service officers face frequent moves and constant organizational and cultural adaptation; and they experience numerous shifts in supervisors and job functions. The Foundation partnered with Booz Allen Hamilton to conduct a study of Foreign Service mentoring programs and identify strengths and opportunities for improvement. The first phase of the project was completed in September 2016, when the report was released to Director General of the Foreign Service Arnold Chacón and senior Human Resources leadership at the State Department. The second phase of the project, which will guide implementation of these recommendations, continues in the spring of 2017. 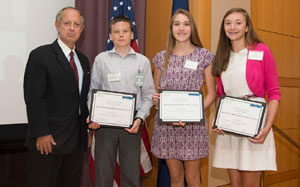 The Foundation partners with the Foreign Service Institute to support highly competitive annual awards for excellence in foreign language instruction. In 2015 and 2016, the Foundation supported the participation of several Cox Fellows at the International Career Advancement Program (ICAP), held in Aspen, Colorado. ICAP supports promising mid-career professionals from underrepresented groups in advancing to more senior positions in international affairs. 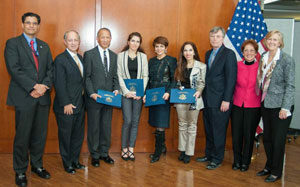 In partnership with the Foreign Service Youth Foundation, the State Department’s Family Liaison Office, and others, the Foundation undertakes programs to support spouses and dependents of Department of State personnel. These programs include a home-based business guide, professional development training, and other initiatives to support spousal employment; support of eFLO, the networking site designed to help employees and their families navigate Foreign Service life; and a children’s handbook. “…we need to create more bridges that allow our diplomats to tap into the energy and ingenuity of American education, innovation, and entrepreneurship—and enable our foreign policy priorities to spark or accelerate new ideas. Developed under Deputy Secretary Burns’ leadership, the Foreign Service Institute’s Center for the Study of the Conduct of Diplomacy is one such bridge—ensuring that we apply the lessons of the past to our conduct and actions in the future.